specifically formulated for the cleaning all types of Dirt Bike. There are no solid particles (no matter what size) to drop out or to be left behind after cleaning and rinsing, therefore leaving exceptionally clean uncontaminated surfaces. 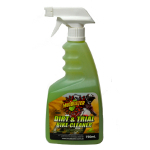 MudBuster Dirt Bike Cleaner is a natural based product and yet performs to the highest levels, it activates when mixed with air and water to eradicate even the toughest dirt without causing damage to your bike.